It's a simple little prop I use when teaching Digital Citizenship to our K-8 #aurorahuskies students. I love utilizing props to try to get my point across to students. To me, it helps a student retain the lesson better. 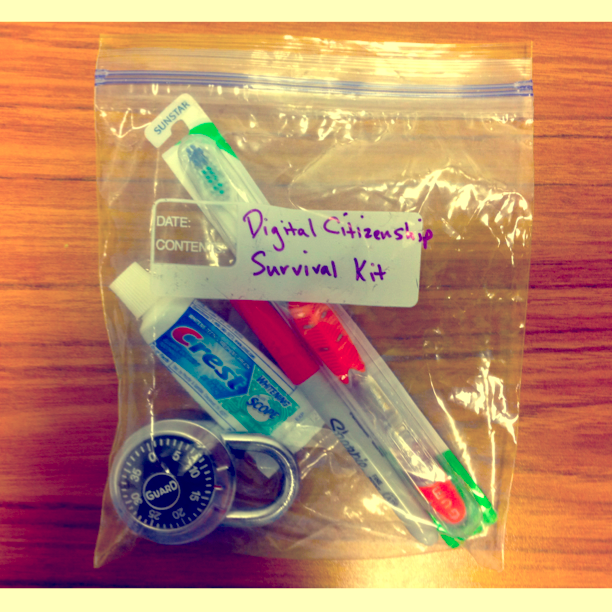 Let me introduce you to Mr. Badura's "Digital Citizenship Survival Kit." Each of the items has a purpose. 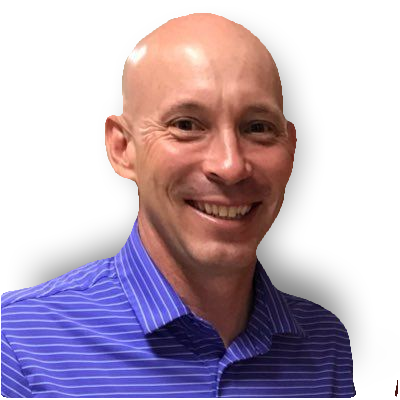 We spend a considerable amount of time addressing Digital Citizenship at Aurora Public Schools and I truly believe we are preparing students for their lives in the digital world. The padlock is to remind students to set strong passwords and to set up passcode locks on all of their digital devices. "Lock 'em down" as we like to say in our Digital Citizenship lessons. Everything that you put online is permanent....even if you hit the delete button after posting. Odds are someone has retweeted, favorited, or taken a screenshot of the material if it was questionable. The survival kit is very simple. It has been a very effective prop in getting students to think about their online behavior. I would love to hear suggestions you might have to make my Digital Citizenship Survival Kit even better. Such a clever idea! I shared this with my Twitter PLN and will be sharing with my pre-service teachers. Thanks! What an excellent idea! I used it with a presentation to students in grades 7-9 and it was very well received. I like how it gave me an anchor for the rest of the talk that I gave - I would refer back to the lock, to the toothpaste and I believe the visual help reinforce the ideas in the students' minds. I love the toothpaste idea, but you might add a small bar of soap to remind students to keep it clean! I LOVE this idea! The use of props the my 8th graders can relate to is great! The soap is an awesome addition. My idea is to add a small measure tape with a quote from the English historian Thomas Babington Macaulay (1800-1859). "The measure of a man's real character is what he would do if he know he would never be found out." Then I would add, "Make sure your character measures up...online and off!!" I think this is a great idea - Maybe you can add a picture of your grandmother - don't post anything you wouldn't be happy for her to see. What a great way to teach students digital citizenship! I am going to borrow this and share it with my teachers! So going to use this. What a great idea! Very clever! I like the way you think. it's great, maybe you can add also a coffee-filter, because we have to filter online content to our need's, and many other reasons. This is a super cool and creative idea! Thanks a lot for sharing it ! I love this! Taking it a step further, I want to use it as a bulletin board display in my jr. high/high school library. I will display each item and explain why it's important. It's a good reminder for everyone! Great kit! I'm trying to think of something to add for "ask before you take someone's photo or publish someone's photo. Maybe a band aide - you wouldn't reach over and put a band aide on someone without asking. This is great idea . Another idea. Just like we need to clean our teeth, we need to keep our computer clean. Keep virus protection up to date and don't download any dubious files attached to messages or emails. I like the soap to "Keep it Clean" and maybe add a small locked diary to remind them some things are private and shouldn't be shared publicly? Sharing this at a workshop. Thanks Craig! I believe that the artifacts are then reinforced for proper claim...? I might add a large pink eraser explaining that once your information is out there you are not able to "erase" or get rid of it in cyberspace! Love these ideas and will be using them; adapting to a K-5 curriculum level. Use a cotton ball to keep your comments, words "soft and gentle" instead of band-aide "owe" type of comments.